In this land of punctuation, the exclamation mark is a superhero who tells a story chock-full of bops and bams, the comma lets you pause to enjoy the weather, and the period is where you must come to a full stop--or else the Grammar Police will get you. 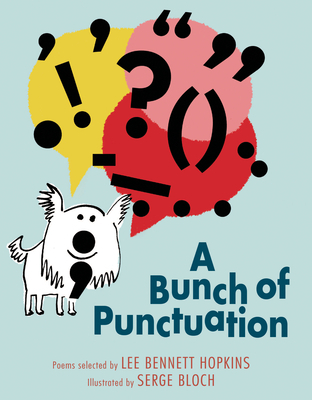 With humor and imagination, A Bunch of Punctuation makes it easy to remember the jobs of the various punctuation marks. Award-winning poet and anthologist Lee Bennett Hopkins has compiled a unique collection of poems featuring brand-new works by well-known poets, accompanied by inventive artwork by illustrator Serge Bloch.